Global demand for lithium metal is projected to rise 8.9 percent per year through 2019 to 49,350 metric tons. Gains will be driven by torrid advances in lithium-ion (Li-Ion) batteries as world demand for hybrid and electric vehicles, energy storage systems, and high-drain portable electronics continues to grow. 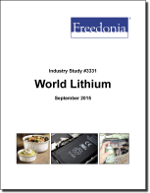 This study analyzes the 32,200 metric ton world lithium industry. It presents historical demand data (2004, 2009 and 2014) and forecasts (2019 and 2024) by product (e.g., lithium carbonate, lithium hydroxide, mineral concentrates) and market (e.g., primary batteries, rechargeable batteries, glass and ceramics, lubricating grease, metallurgy) for six world regions and 19 major countries. The study also considers market environment factors, details industry structure, evaluates company market share, and profiles 32 industry players, including Sociedad Quimica y Minera de Chile, Rockwood Lithium, and Talison Lithium.